Update: As I add new strategies to this thread I'll also copy them here so they are all in one place. The first nine strategies were in the original post, each additional strategy will be copied here. That way, you can look for the separate post for the new ones and easily find any discussion following the post. Update: I added a few calibration STL files. I've watched folks struggle to achieve the results they want/expect here for several years - heck, I was one of us. Like all new endeavors, there IS a learning curve with 3D printing. This is still the pioneering era for desktop printing and we are very fortunate to have such a great community here as well as other resources on the web. But the challenge with all the information out there is finding it when YOU need it and deciphering the many different opinions and practices - some of which are good and some of which are, well, let's just say "poppycock". There are many different means to the same end but I assert that those who figured something workable (AND reproducible) out most likely took a disciplined approach to reach their goals rather than the shotgun approach of trying one thing after another. So, I thought it would be helpful to describe a method that you can use to 1) develop a reproducible approach to successfully printing the things you want and 2) improving the quality of your prints to meet your (realistic) expectations. I'll likely do this as a series of posts starting with this one. Don't hesitate to join in or ask questions. After some time, I'll consolidate the posts into a single source (maybe a pin here) that will make it easy to find. #1 Get Experience. Start with the printer. This is more difficult than it seems because without experience, it is hard to know if you have a mechanical or electrical issue, slicing issue or if something else is going on. So, to that end, keep things simple until you have some experience. By "simple" I mean, don't print the Eiffel Tower model to start, print a simple, reproducible and small item many, Many, MANY times until you nail it. For me, I used the calibration cube. In retrospect, I should have picked something much simpler (see strategy #2). #2 Start Simple. We have a tendency to want to jump ahead to more complicated prints, faster printing, bigger prints, etc. There are many aspects to successful 3D printing, everything from the printer (which in itself has a mechanical system, electronics system, hot end, extruder, heated bed, firmware), to the slicer (and all of the parameters available to control the slicing), to the filament itself, to the actual item being printed. With so many variables (100s, maybe 1000s of them) it is really important to pin down as many of them as you can. One very easy place to do this is with the model itself. Develop your experience printing the same model over and over until you nail it. Even with a simple model, you can (and should) approach printing it with a methodical approach from the ground up. That's the next strategy. #3 Practice in Measures. I play guitar and was basically self taught. When I found new music to learn, I did what many untrained folks do and practiced the part over and over again from beginning to end. If I made a mistake, I started over. Then, I took lessons from a trained musician. My very first lesson was worth every penny! My instructor watched me learn a piece and then said "Practice in Measures". What he meant by this was to learn the first measure (music is divided into small blocks of notes called measures which are small and relatively simple). Practice it until it is perfect. Then, practice the second measure until it's perfect. Next, combine the first and second measures until that is perfect. Continue in this way until you've learned all the measures and combinations of them. In complex pieces, there will be a few measures or sequences of measures where you need to put in a lot more practice. How does this apply to 3D printing? Easily, start with a simple object to print and practice nailing the first layer. Once you have that nailed, print the rest of the object. Once you have the entire object printed successfully, change slicing parameters and start over (nail the first layer, ...). Practice in measures. I can't say enough about getting that first layer right, the subject of the next strategy. #4 Nail the First Layer. I don't believe folks spend enough time learning to print a perfect first layer reliably. If there are defects in the first layer, they will invariably come back later to bite you - the part separating form the build plate or a defect in the part. Trying to print a good (or great) first layer is probably one of the most frustrating experiences for most, it is also the most critical. 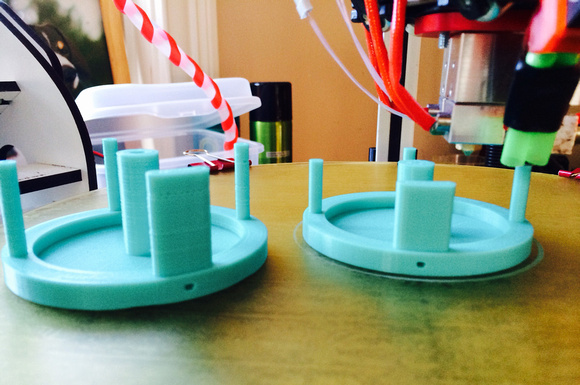 Here's where strategy #3 comes to play, don't continue a print on an inferior first layer! Abort the print and start that first layer again and again until you nail it. Why waste time on a part that will most likely fail or not be useful? Each time you print a first layer, measure it! If you tell your slicer to print a 0.20mm first layer, then it should be pretty darn close to 0.20mm. If it isn't, you've identified a variable that you can easily fix and nail down (Z height). 0.20mm is not a lot and unless you have highly calibrated eyes, you can't tell the difference between 0.20 and 0.15mm, but your printer sure can. At 0.15mm the first layer is going to squish onto the print surface. It may even seem like you are getting a great first layer and great sticking (which you are) but later, you'll discover the part is nearly impossible to remove or your extruder will start making that all too familiar TICK, TICK, TICK sound from missing steps. A perfect first layer will go down smooth and consistently time after time. TIP: polish the tip of your nozzle! Chared filament and scratches on the very tip of the nozzle are dragged over the layers as it moves around. Best case these leave a visible mark on the print, worse case they rip the first (or higher) layer off the build plate. E3D recently released a blue silicone sock for their V6 hot end. I've been using several of these for a few months and can recommend them highly. Not only do they insulate the heater block and nozzle but they also provide a nonstick surface around the nozzle. I do an initial nozzle polish and then install the sock, after that I haven't had to polish the nozzles again. #5 Slow Down. Back to my guitar lesson example... The other thing my instructor taught me in that first lesson was to practice slowly (using a metronome) until I nailed the measure(s) at a slow tempo. Then, gradually and consistently, increase the speed. The same applies to 3D printing, print slowly at first. This gives you time to observe what's going on (strategy #6) and just simplifies everything. I like to start new folks at 20 to 25mm/s print speeds. What's the hurry? If you print 10 aborted prints at 50mm/s what have you gained (or lost)? Printing slow helps all parts of the printer, from the mechanics to the extruder to the plastic filament coming out the nozzle, stay in balance or equilibrium. Fast movements can highlight mechanical issues, extrusion issues, etc. But when you are first starting out, you don't know how to identify and isolate these issues. In fact, even with all of my experience, if something starts to go wrong, I slow down. That removes a lot of variables and gives me a chance to see what's happening. I've identified everything from loose pulleys to a worn joint on a delta arm to separating arms on magnetic ball joints! And, I've helped a lot of folks identify other issues simply by slowing down. #7 Keep Notes. I can't stress how important it is to keep notes. I have a word processor file I add notes to as I go. In particular, I keep a section on the filaments I use and the detailed printing parameters for them (strategy #9). Perhaps I'm becoming forgetful in my advanced age but I don't like solving the same problem over and over again. If I keep a note about a problem and my solution, I can usually find it again pretty quickly. Once comment on notes, don't be afraid to purge! After a few years of doing this, my file got quite big. Recently I archived all of my H1 and H1-1 notes. I don't refer to them any longer so why keep them in my working notes? #8 Be Consistent. A CEO friend I worked with many years ago was fond of saying "Consistency is the hobgoblin of small minds!". I understood what he was trying to say but it has to be taken into context. When you are first learning any new activity, it is critical to be consistent. If too many things are changing at once, you have no idea what contributed to a good or bad result. Don't change too many things at once. In fact, if you can isolate and change just ONE thing, you will have a much better chance of success and understanding. This isn't always possible so lock down as many things as you can. If after a run of successful printing you run into a problem, go back to a known good state (see #7 - you did keep notes on what this state was didn't you?) and start there. Many times we try to change too many things in our frustration and that almost always makes things worse. Step back and think about how to isolate the problem areas with as few changes as possible. #9 Know Your Filament. This strategy is a bit lower level than the previous eight but important and often overlooked. I see a lot of folks just assume that they should print filament X at temperature Z - for instance, print PLA at 200°C. This might get you in the ball park but if you really want to get to consistent and GREAT results, profile your filament. It's easy and if you write it down (see #7) you'll never second guess how best to print that filament again. It's important to realize that higher temperatures are not always better, they can actually lead to issues - parts that are just a little too large, parts that stick to the bed too well and can't be removed, blobs on the print, stringing, and a host of other problems. In general, I like to print at the lowest temperature possible for PLA and ABS. Then, as I ramp up print speed, I also need to ramp up the hot end temp a little since the filament is not resident in the hot zone for as much time. I suspect little details like this cause people more problems than they might appreciate. Note: The extrusion feedrates below are for 1.75mm filament. Since extrusion is based on mm of filament fed INTO the extruder, feedrate for 3.0mm filament will beed to be significantly decreased. The best way to do this is to calculate using max FLOWRATE for your hotend. This is the maximum volume of filament that can pass through your hotend/nozzle at a given temperature. For instance, an E3D V6 hotend with a .4mm nozzle has a max flowrate of about 10mm^3/s - regardless of the diameter of the incoming filament feedstock. The Volcano addition increases this significantly to about 25mm^3/s because they have a much longer melt zone. Use the manual controls of your host to extrude 50mm at 1mm/s and watch and listen. If the filament extrudes nicely, reduce the temperature by 5°C and wait for the temperature to stabilize. Repeat by adding 1mm/s until you reach a temperature where the filament does not extrude well. At 5°C to that temperature and note this as the "low extrusion temperature" for that filament. Use this low temperature whenever you are printing slowly (print speeds of 20-30mm/s). You might find some filament need to be bumped up a bit more than 5° so don't hesitate to experiment and find that lowest reliable extrusion temperature. Once you have the maximum feedrate, you can use that to calculate the maximum flowrate. Don't forget to measure the diameter of your filament too! Not all filaments are created equally. Measure in several locations to get a sense of variability. Most of the slicers let you enter filament diameter and they will calculate a reasonable flow for you. maximum flowrate = 4mm/s * 3.14 * (1.75mm/2)^2, which = 9.6mm^3/s - this is very close to the maximum flowrate for a stock E3D V6 hotend and is the upper limit to how much material you can push through it. So this is the absolute maximum speed you should expect to be able to print under these conditions of layer height and extrusion width. Note that if you increase layer height or extrusion width, your maximum print speed goes down and if you decrease the layer height or extrusion width your maximum print speed goes up. Also note that these are theoretical maximums, in practice you most likely will need to reduce print speed by 5-10mm/s or so. That's it for this first installment but I do want to leave one last parting tip. TIP: When you are starting a new print session, give the printer a little warm up exercise! Much like an athlete warms up before a game, don't just turn the printer on and attempt to print. Turn it on and let the hot end get up top equilibrium, let the heated bed get up top temperature. I even like to print a quick part (a 20mm diameter cylinder 5 mm tall) to make sure everything is up to temp, in equilibrium and working properly. It's quick and easy to do and can help eliminate a lot of problems. I am VERY persnickety about the aesthetics of my 3D prints. My 3D printed fly fishing reel is seen from all sides and so it is important that the first layer is flawless and visually appealing. A perfect first layer finish is not required for all objects - consider the base of a Yoda or vase - but if you practice getting a great first layer on these non-critical pieces you'll be prepared when you need a visually perfect first layer on another project. This isn't an exhaustive list but it does include the big hitters and, as you can see, there are a few of them so it is very important to take a methodical (#2 and #8) and documented (#7) approach when solving bed-related problems. This is also a place where careful observation (#6) can play an important part. I'm not going to go through all of these in detail now but did want to comment about the last one - cleanliness. Whatever you do, make sure everything near and on your printer is clean and grease free. Silicone greases and lubricants are especially problematic since they are invisible and very difficult to remove. Keep them away from your machine. Your fingers are a prime source of contaminants. Every time you touch the filament or bed, you risk leaving a greasy print (see my observation in #6) and these can (and will) cause issues. I try not to handle filament with my bare fingers, I use cotton gloves. If you use a plastic or rubber glove, make sure it isn't coated or powdered - we're trying to eliminate sources of contamination, not introduce them. On the occasions that I do handle filament with my bare hands I wash and dry them thoroughly first. This is one area that I think affects a lot of user's and is completely overlooked. How many times have you loaded filament right after eating chips? It introduces a big variable that can be difficult to track down, so develop good habits and eliminate contamination as a variable. Your fingers can also leave contaminants on the bed when you remove a part or brush off stray filament strands. Don't touch the bed surface if at all possible. If you do, clean/degrease it with an appropriate cleaner. For uncoated surfaces like borosilicate glass, PEI, the various 3d party surfaces (PrintInZ and BuildTak), and films (window tint, Kapton) you can use isopropyl alcohol. I like to use the little packages of wipes as they are convenient and safe. You can also do a quick wipe of your fingers before tossing it in the trash. It is more difficult to deal with coatings like PVA glue, glue stick, and hairspray since these can't be cleaned. If you suspect a contaminated coating, your only recourse is to remove and reapply it. Finally, don't overlook filament storage, keep it clean too. I store mine in large zip lock bags to keep off dust. You can put packets of desiccant to help remove moisture in the bag too. Patient: "Dr. it hurts when I move my arm like this." Dr.: "Then don't move your arm like that!" The first point of this joke is, many people do the same thing over and over again without making any changes or stopping to think about what to change (see #8: remember, change one thing at a time) - as if just repeating the same print with the same parameters will magically solve the problem. It won't (see my footnote below). The second point of the joke is that the Dr. didn't attempt to actually determine why the patient's arm hurt, he just had him avoid the problem. I see that a lot too. Usually it takes to form of "I tried printing it with my red PLA and it failed but everything was fine with my blue PLA". There are many other variations on this (changing slicers for example). Learn how to diagnose problems. This requires careful observation (#6). Once you've identified where the problem occurs (let's say getting the first layer to stick) then PRACTICE that piece (see #3) until you sort it out. No need to run through the entire process over and over. Isolate the problem, formulate a hypothesis on what you think might be happening and design a test to prove or disprove your hypothesis. If you see a problem and can't formulate a hypothesis THEN seek help! Or, pre-test your hypothesis here to get some experienced feedback. But, whatever you do, try to work through the diagnostic process yourself first, that's how you learn. Footnote: Many years ago (20) my company had an annual laboratory safety week (I worked in a corporate R&D lab with lots of nasty stuff). One of the annual favorites was a gentleman from OSHA who talked about electrical safety. He started his presentation with a black and white video from the 1940s (I think) of a speaker walking up to a microphone on stage. The presentation was being filmed. The speaker reached up and grabbed the mic and was immediately thrown back and fell to the stage unconscious. Members of the audience rushed up to help him. This was all on video. As 4 or 5 people worked to help the victim, you see a gentleman casually walk up to the mic, reach out his hand and touch the mic. He was immediately thrown back and collapsed on the stage next to victim #1. Literally 30 seconds later a THIRD audience member walked up to the mic (now there are 2 victims on the stage and a hoard of people working to revive them) and carefully reached out his finger (looked like the scene from ET) and very, very gently touched the mic with just the tip of his finger. He was immediately thrown to the stage as the third victim. All of this was caught on video. No one died (we were told). Neither of the second two victims stopped to think about the problem, consequences or solutions. #12 Be a Fanboy. I am probably going to lose some fans for this post about cooling fans! Don't think of a part cooling fan as an object. Instead, think about "air flow". If you need cooling on a PLA (or other material) part, then you need to understand air flow. Not all cooling fans are created equally. Consider this, some folks use a 40mm, some a 25mm, some (like me) a 25mm squirrel cage fan. Some are mounted to blow the full fan width stream at the nozzle area, some have a duct or some (like mine) have a very focused soda straw duct). So comments like "run your fan at 1/2 speed" are not specific enough to be useful information. Instead, you need to understand how your particular fan, it's arrangement, your material, etc, all relate to the air flow. Firstly, using the previous strategies, try to minimize or eliminate the need for any sort of air cooling. Slowing a print down (#5) is one great way to do this. It also gives you a chance to see (#6) where any problem areas on a print might be. You can use this information to focus the right amount of air flow on the problematic areas. The tendency for many is to use as much air as possible. It is much better, more consistent, and more reliable to use as little air flow as necessary. This puts less thermal stress on the printed part. When you do determine you have a problem that only a fan can solve, start conservatively. I also seriously recommend using a duct of some sort to focus the air flow where you need it. Ideally, the fan would have the ability to follow the print nozzle and direct a small stream of air to the filament right after it is laid down. That is a difficult problem to solve, so most of us direct the air to area around and under the nozzle. But, by directing the air (duct) you can reduce the air flow significantly since it is now focused where you need it. Here is an example of some of my fan research. The part on the left failed (in a previous run) as you can see due to warping caused by an unducted 25mm inducted fan blowing at 50%. The part printing on the right was my first attempt at using flexible soda straws (2 of them) to direct the air flow to exactly where I needed it. I also ran the fan at 20%. (2/15/2017 UPDATE: this directed "soda straw" part cooling has been working very well for many part geometries and filament types including PLA, ABS and PETG for several years now). The angle of the photo doesn't show it clearly but the "double barrels" are focused at the tip of the nozzle. The "dead air" space between the tubes prevents air from flowing over the nozzle. I know, it's terribly clever! It's a work in progress and I've almost got it perfected with a printed double barrel nozzle. I suggest doing your own experiments and observations but start conservatively. I don't use a fan during the entire part. If you find you need to turn the fan on at full blast from no air flow, do it in stages so the hot end can equilibrate properly. You can do this manually, some slicers can support it, or it is easy enough to learn the simple "fan mcodes" to manually insert them where you need them in the gcode file (this is what I do for tricky parts). Using a focused air flow, lower air flow and the step up technique I just described, you won't see a significant drop in hot end temperature and you won't see a tell tale sign on the part that Polygonhell mentions. PLA has this interesting property that if you change the extrusion temp at the hot end, it has a visible effect on surface sheen of the part from matte to gloss as you raise the temperature. RichRap has written an excellent post about how he uses this phenomenon when printing decorative vases. Although he was varying the hotend temperature, a similar effect can occur with improper air cooling. I'm also an advocate of using off-platform cooling. By this I mean strategically placed (ducted) fans that direct air to problematic areas of a print. These can be mounted to your vertical columns or simply sat on the bed if it is not too hot. With ducting, you can reduce the air flow considerably and keep the cooling right on a "hot spot". This technique does require manual adjustment, repositioning, etc. But, it you are trying to print a really tricky part, it might be the only way to do it. Frankly, the part cooling capabilities of desktop 3D printers is extremely primitive at this point. It's fine for the majority of objects you might print but as we push the envelope on what's possible, part cooling is one area that needs some more work to automate it. Consider this, the way I maintain very tight tolerances on the rotating spindle and hub assemblies on my fly fishing reels is to use a low beam of air cooling on the spindle as it's printed. This "locks" the filament in place in a very predictable way. Once I printed a few parts and measured them to make sure there was little variation, I incorporated that into the design to get exactly the tolerance these parts required. I'll post calibration things here. 5) eliminate blobbing and other surface artifacts - follow the guide above, print slow, adjust retracts, etc. KEEP NOTES! Highcooley's Onyx Bed Leveling Aid is a great one to test your calibration. Highly recommended. If you can print it perfectly you've "arrived". I couldn't find a similar thing for the Orion. If you know of one, let me know and I'll add it. texsc98 took the challenge and created a parametric version that has defaults for Orion. You can use this set of files in a number of ways - everything from testing calibration results to exploring slicer options to breaking in a new filament. These are designed for a .2mm layer height. The first cylinder (pt2mm tall) I call the Simple Single Layer Test and is my workhorse calibration object for tuning first layer adhesion issues, profiling new filaments and host of other uses. It is one layer high and can be used to test adhesion to the bed and first layer thickness (measure it with a micrometer or calipers and compare to what the first layer height was supposed to be). You can use this to tune your printer and slicing parameters to get perfect infill and explore the effects of speed on infill quality without wasting a lot of time and filament printing larger parts poorly. I also use it when I am testing a new filament to dial it in. It's a really versatile tool and I use it every day. This cylinder is .4mm tall, or two layers. It can also be used similar to the first cylinder but the second layer will show issues in orthogonal movements to the first layer. It also provides a little more thickness to measure to verify layer height. It can also help tune the top capping layer. The last cylinder is .6mm tall, or three layers. Again, it can be used like the first two. I don't use it as often. Last edited by mhackney on Sun Feb 22, 2015 4:23 pm, edited 24 times in total. Thank you for the excellent post. I will print this out and keep it in my 3D printing log book. Thanks MrJoe. I want to get to the point that when someone asks for help I can simply reply something like "#5"! I fixed a bunch of little typos. I really hate spell check sometimes! Thanks McSlappy. I'm working on some additions. But, we just found out our furnace died tonight and it is winter here and going down to 10°F (-12°C) tonight! I won't be able to print when the step inside the house drops. At least we have a fireplace to keep things from freezing. Just a quick thanks too! I am getting closer to getting the PLA dialed in. Last night I had some of my best results thanks to all your suggestions mhackney! Still have a few random strings (extremely tiny and just a few) so I am getting close. Keep up the great work and thanks again! jwalrath, that's great that it helped someone in its first 24 hours! I can print the same part 6 times and one of them might have a string here or there. I suspect some very subtle variation, perhaps air flow or air temperature changes or something. At least they are so small that they just wipe off with a cotton cloth. Careful with acetone, it is very flammable and is toxic so handle it carefully. I prefer isopropyl alcohol for the convenience of the wipes and maybe a bit better safety. For blobs, see the previous tips. Profile your filament to use the lowest temp, go SLOW. There are some other more specific anti-blob strategies but I don't want to get on my "nozzle length" soap box - yet! this is a great guide.. it has me relooking my printing... i actually am going back to scratch and testing cube with first layer etc. but my e-steps are pretty accurate, so not really sure if its just a fraction off on my z - height, but I dont think you mention extrusion multiplier in your guide.. perhaps its something to consider? EDIT: Holy poo... I cant tell you how good my first layers are looking running 90% extrusion multiplier.. NO gooping, no issues that im seeing at all.. Before i would always kind of see a channel, with a little more filament pushed to the outside of that nozzle path, and of course invariably, that would cause a little to stick to the nozzle and deposit later... Im running another cube (infill screwed me last time) and ill see what happens, but this could be a GAME CHANGER. Then ill have to test retraction... I have a feeling ill have to adjust that... 215 degrees and 90% extrusion are the 2 changes ive made today. Last edited by dunginhawk on Thu Jan 15, 2015 4:58 pm, edited 1 time in total. I'm about ready to publish some STLs to use. I need to test them all. I'll publish a set for .4mm nozzles first and then .5mm later. Any other requests, let me know. I haven't started getting into details yet. This is a high level strategy guide. But I do plan to take it down to the practical as well. On your problem duginhawk, measure the filament diameter (I am going to go back and add that to #9, it slipped my mind!). If it is larger than 1.75mm that is what reducing extrusion multiplier helps. However, not all filaments behave the same and some die swell more or less than others. The slicer can't predict this so imperial testing is the best approach. For instance, the bronzeFIll and copperFill filaments from ColorFabb have very little die swell and I've found I need to increase my flow by 8%. EDIT: I added the filament diameter to #9 in the first post. Quick question about layer cooling fans. So I have been following Michael's suggestions and finally got most of if not all the PLA issues I was having up to this point sorted out. Last of the stringing has been eliminated. So onto the next set of tests and prints. I have something that gets wider each layer that is printed - I guess that is called overhang. The overhang is around 18 degrees I think. I was getting some poor results and sagging as each layer printed. Up to this point I have NOT been using layer cooling of any sort. I read in a lot of places where people are running 60% and higher. I figured the fans might help with this type of print. Problem I am seeing is that not long after the fans come on, the print starts losing adhesion and starts to curl and peel up from the bed. I even went down to 15% and see this. I tried setting them to come on after layer 5 then I waited until layer 10 and even tried waiting till layer 15. By layer 12 or 13 the curling/peeiing stops but I already have sag starting so it is a bad print. Any idea? I am curious what layer cooling fan speed you are using mhackney? Thanks again for all the help. If you run a cooling fan I would recommend you run it for the entire print, start the fan before you heat the Hotend. There will be some lag before the heater for the Hotend can respond to the fans additional cooling and I have never seen a print where you couldn't see the exact layer that the fan was started. You want as much cooling on PLA as you can get and still get the Hotend to temperature. You also want to print it at as low a temperature as you reliably can. Note that some cheap filaments have severe inconsistencies through the role, so the temperature you can print at reliably at the start of the print might be lower than what's required at the end of the print. Just read through your post and kind of discovered some of this on my own last night after I submitted the post. I have a few prints that seem to need fans and I did a step by step approach similar to the PLA stringing and jamming stuff. Found the perfect settings (I think) and am trying now to do a really difficult print that up to this point has not worked. So far it has started and appears to be working (long print so I don't have results yet). Again thanks for all the feedback - definitely a meaningful and insightful explanation. I made a couple of updates while you were posting Jeff so you might want to skim it again quickly - especially the last 2 paragraphs. Thanks also for the thanks! mhackney wrote: I made a couple of updates while you were posting Jeff so you might want to skim it again quickly - especially the last 2 paragraphs. I love all the notes. Would you happen to have pictures at different angles of that tube set up you've got going on? And you don't have an .stl for the holder for them do you? I've very interested in trying that out.